Nobody knows docks better than those who use them. Located in the heart of Minnesota lake country we get a lot of product testing in. Voyager Dock is the ultimate dock system- one that’s strong, stylish and maintenance free. Around here we can’t settle for less, therefore we have to have the best and we prefer to do it in style. No bars or trusses under the dock means no weeds or webs. Eliminating the hassle of constantly having to clean and giving you more time enjoying the lake and time with your family. Solid sides keep your family, guests and pets safe by eliminating the chance of hands, feet and paws becoming tangled in trusses. Bolts, tie-offs and welds are also safely out of the way. All-aluminum, marine-grade framing — no flexing, no sagging, no problems. It’s the most solid frame out there. Keeping your dock always looking its best. There’s no rusting and no painting. Dirt and grime wash away easily. Height adjustments on the roll-in model take a few quick turns of the wrench. Save your time and money and spend it on the fun stuff. Get just about any dock accessory you can imagine. Voyager Marine accessories are sleek, stylish and easy to attach and remove just like Voyager Docks. The only way to make your Voyager Dock even better is by adding Voyager Marine accessories. Standard 4′ and unique, extra-wide 5′ docks come in 8′, 10′ and 16′ lengths and can be attached side-by-side, end-to-end, end to side, or in any format you wish. If this still doesn’t meet your needs ask about our custom 3′ and 2′ wide options. You decide what you want and we’ll make your dream dock come to life. 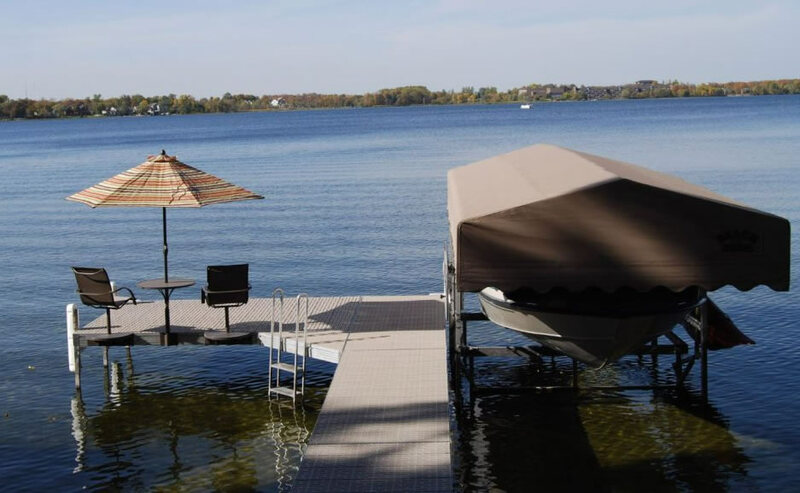 Eagle River Dock and Lift provides Boat Docks, Boat Lifts, Piers, and other marine products to the Eagle River, Minocqua, Sayner, Rhinelander, Boulder Junction, St. Germain and surrounding areas. As well as marine recovery with our barge crane. © 2019 Eagle River Dock and Lift. All Rights Reserved.